The use of disposables in biopharmaceutical manufacturing has increased significantly during the last few years and is expected to grow substantially in the near future. Bioplan Associates report in their 2007 “Report and Survey of Biopharmaceutical Manufacturing Capacity and Production” that the main drivers for this ongoing trend continue to be the elimination of cleaning followed by the reduction of capital investment in facilities and the required equipment. However, with the further penetration of disposables into larger volumes and more critical areas, companies involved in biopharmaceutical development and the production of new molecules started to investigate more closely the advantages, limitations and facility implications of single-use manufacturing scenarios. Whereas in the past, disposables where recognized as useful components in the production of biopharmaceuticals, today a new buzzword has found its way into the biopharmaceutical lexicon. The challenge is to design and implement application-specific integrated process solutions that follow the same principles as conventional process designs in respect to engineering, automation and control. It is important to accept that disposables are not a “one-stop-shop” solution but have to be intelligently integrated into new and existing process designs. How many disposables and where to use disposables must be evaluated from various aspects and needs to be carefully analysed in respect to the application and the customer-specific situation. In addition, the possibility of a combination of reusable and disposable technologies must be considered as a “Hybrid Technology.” Currently, disposables are mainly used during scale-up and clinical production. In commercial manufacturing, the use of disposables is usually still limited to tubing and filter cartridges; however, with the development of disposable technologies into the area of commercial production, the need for integrated single-use process designs becomes absolutely obvious. By recognizing this, well-established industry value propositions such as engineering, process integration and automation and control receive increased attention. Because of the nature of the disposable supply chain and implementation scenarios, assurance of supply and thorough vendor support during the entire drug product life cycle become essential for establishing Confidence of Ownership in this technology. Recognizing that a generic manufacturing process can be classified into the process steps of Upstream Processing, Downstream Processing and Form/Fill is not new. To evaluate the impact of disposables on the design of biopharmaceutical manufacturing facilities, one needs to distinguish between clinical development and commercial production. In media preparation, disposables have been in use for a long time. Cell cultivation steps in clinical development and small- to mid-scale production have benefited from the use of disposable systems during the last 2–3 years. Disposable seed cultivation systems based on rocking motion agitation have been implemented successfully in many processes, which leads to the question regarding which systems have made their way from cell cultivation to production scale. In 2007, manufactures spent an average of $212,959 for the implementation of disposable bioreactors (1). In this area, a lot of new developments have been presented by multiple vendors. The common request from the user has been: “Show that the performance with respect to cell density, viability as well as productivity is equal or even better than with traditional bioreactors and apply similar rationales than for traditional systems.” That is the reason why products that have learned from the main features of reusable systems, such as height to diameter ratio, agitation method and gassing strategies, have received the highest attention. If one looks at downstream unit operations, it is even more important to distinguish between clinical development and commercial production. Some technologies can be applied to commercial scale and some technologies are not capable of handling volumes larger than 500 L. At a scale up to 2000 L, harvesting is commonly done by applying disposable depth filter systems and it has been reported that the first centrifuges are now becoming disposable too. Ultrafiltration/concentration steps have begun to become fully disposable at scales of up to 100 L. Protein A chromatography steps are reusable, which will not change in the near future. Polishing steps, filtration and mixing steps are more or less occupied by the use of disposables up to mid-scale commercial production as the volume of the purified product at this stage is already less by a factor of at least 10. Product hold, transfer and storage are classic areas where disposables are already fully established throughout the clinical development phases up to mid-scale commercial production. Accepting this level of limited penetration, how can one simplify the complexity of such processes regarding the proper implementation of disposables? In fact, looking at all these process steps and talking about disposables as being partly implemented already, one needs to consider that some disposables have historically been implemented because of the advantages they provide … and not because users are fully confident of “owning” this technology. There are just a few areas where users in large-scale commercial production, for example, are fully satisfied with the historical performance and process integration compared with the reusable world.This is one of the reasons why large biopharmaceutical companies preferably use disposables in clinical development phases. Contract manufacturers, instead, benefit from disposables as the advantage of being highly flexible — by not having invested in a fully piped plant — might override existing deficiencies. From a manufacturer’s perspective, there is one key argument that needs to be taken into account: Risk Management Strategy. “In choosing among craft, batch and mass models of manufacturing, a company weighs the value of scale against the potential for the market. How certain can we be that a particular volume of product X will find a market within time period Y? As the expected rate of profitable production rises, the answer shifts from small-scale, one-at-a-time craft production to batch production and ultimately to mass production” (2). Technologies applied to these manufacturing scenarios are different, as they need to provide optimal output versus time by ensuring safety and maximum profitability (disposables up to batch production and reusables for large-scale mass production). One can conclude from this distinction that there is a huge area wherein processes will need to rely on hybrid approaches depending on the specific process needs, of course. There will indeed be a further penetration of disposables but, increasingly, they will be embedded into a hybrid approach. From the pure technology evaluation angle, there is one approach that might help to reduce the complexity. Looking at some limiting factors for the penetration, such as connectivity, capacity, regulatory compliance and facility layout, a further separation of the process into its unit operations looks like a method that can help to evaluate which technology is best for an individual task. For example, a unit operation like mixing will appear multiple times within the manufacturing process. Media preparation, harvest suspension before purification, intermediate hold steps during purification that require gentle agitation, virus inactivation and final formulation require mixing. This requires the definition of a mixing technology platform that allows a proper and uniform design for each of the mentioned applications. Once defined, this mixing platform needs to be able to serve the needs throughout the volume range from 10 to 2000 L.
The platform-based unit operation approach will further answer the question regarding connectivity or automation and control for all areas applied, as the interfaces and the flow characteristics are identical. Highly sophisticated cost models can be precisely adapted to the specifics of each unit operation defined. Furthermore, “enabling technologies” that benefit from this approach are disposable bioreactors, disposable sensors, membrane chromatography, viral clearance and freeze and thaw. This strategy more or less follows the “plug and play” approach that sounds trivial but helps to decrease the complexity. Looking at the implementation of integrated single-use manufacturing concepts based on unit operations rather than on components or single systems will help evaluate technologies on their ability to serve as a platform technology whether they are disposable or reusable. In the end, each process will remain unique and, therefore, disposable technologies will need to be able to be easily connected to classic, reusable equipment. The first indication for the decision on technologies will be developed when looking at the scale of the process to be engineered. Figure 1 visualizes a possible decision tree based on volume. It confirms that disposables are widely specified up to the pilot plant level. Hybrid scenarios based on reusable and disposable unit operations are applied to process volumes up to 5000 L scale and fully reusable manufacturing scenarios are applied from the 5000L scale upwards. Because the question whether a manufacturing plant will follow a reusable strategy, a hybrid or a fully single-use strategy is mainly raised during the first planning phase of completely new plants, engineering gains utmost importance. Because of capacity constraints and the connectivity limitations of existing disposable systems, engineering is the key aspect that determines the success of a newly designed biomanufacturing facility. Process engineering for plants that rely on reusable unit operations is highly sophisticated and looks back on more than 30 years of experience. However, process engineering for plants that rely on hybrid approaches is still in its infancy. The already mentioned connectivity constraints lead to multiple options for the connection of unit operations. Sterile connectors, Steam To connectors, Steam Thru connectors as well as non-sterile quick connections need to be equally considered for a proper process design depending on the interfaces. Automation solutions ranking from dedicated local controllers to high-level system integration using PLC/SCADA or DCS control systems cannot yet be fully applied to the disposable parts. Common algorithms need to be adjusted considering the different nature of both technologies. The unit operation approach discussed earlier will help to combine unit operations by using platform technology connection methods using well-established SCADA platforms. The DCU-4 (Digital Control Unit) system is one example of applying well-established automation algorithms to hybrid processes. 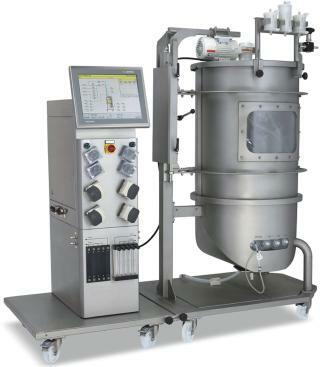 It serves mixing systems, cell cultivation systems as well as crossflow systems at all stages. All these unit operations can now be equipped with either reusable or single-use components relying on a well-established automation platform. Users do appreciate such initiatives, as this will allow them to apply disposable solutions where they have not been able to apply them before, due to missing automation. Disposable sensors that are fully integrated into the respective single-use containment need to ensure the control of important parameters for each unit operation (such as DO, pH, conductivity, etc.). Another buzzword that has been created when talking about integrated single-use manufacturing concepts is traceability. 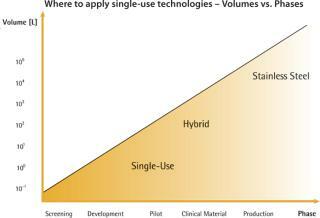 By applying single-use unit operations, tracing material becomes more and more of a challenge. Looking at the life cycle of a complex disposable bag assembly, for example, that is equipped with multiple tubing lines, a filter and a sample bag, it becomes increasingly difficult to apply proper SOPs that allow full traceability. Other sectors, such as the logistics industry that deals with this kind of complexity, introduced Radio Frequency Identification technology (RFID). Historically, single-use systems could not benefit from the use of RFID technology as the RFID tags that are attached to the system have not been compatible with gamma irradiation. Gamma irradiation is the common method for the sterilization of single-use systems. There are just a few areas where users in large-scale commercial production are fully satisfied with the historical performance and process integration of disposables compared with the reusable world. Meanwhile, the first RFID-tag that is compatible with gamma irradiation has been launched, which allows one to exploit the advantages of RFID technology in the biopharmaceutical world. Manufacturers can identify, encode and write product-relevant information during manufacturing without logistical challenges. Endusers can also use the remaining memory of the prewritten RFID tag to write and store drug product lot and process data information and store this information in an audit trail database. This technology even has the future potential to provide additional advantages in the areas of process control and monitoring. Assurance and security of supply gains a completely different dimension when using disposables or single-use technologies in commercial biopharmaceutical production. It is very often not sufficiently analysed or even neglected when deciding on disposable technologies or suppliers. The best product features and most commercially attractive solutions might become completely useless if the supply of the relevant products has not been secured for many years. In the production of clinical test material, the non- or delayed availability of disposable production technologies already causes huge problems. Appearing in the later phase of commercial production, the negative impact caused can represent millions and even billions of dollars in losses. Basically, one can say that when selecting a supplier for disposable technologies, this supplier automatically becomes a strategic supplier. But who would normally select a non-secure supply source as a strategic supplier? Thus, it becomes quite obvious that the process of selecting a technology and supplier becomes a very critical parameter during the process development phase. Will the technology I choose still be available in 5–10 years? Is the technology I choose free of any IP issues? Is the supplier I choose financially strong and do they have a proven track record? Does the supplier I choose have sufficient production capacity and plants in case of emergencies? Is the supplier I choose likely to stay independent or will this supplier be acquired in the foreseeable future? 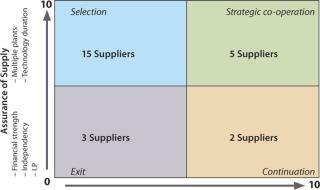 Of course, there are many more parameters that can be taken into account when selecting a technology or a supplier; however, one very important so-called “soft fact” should be considered from the experience and point of view of the authors: how flexible is my supplier in co-operating with other suppliers (including competitors) if I were to select a component that is not in the portfolio of the selected supplier? Does my supplier give me a choice or do they want to force me to become 100% dependent on them? A good example of a professional and customer-oriented approach is “Confidence,” the validation service of Sartorius Stedim Biotech. From the beginning in the early 1990s, this service was open and offered to all relevant technologies and suppliers including those from the competition. Another good example is the co-operation between Sartorius Stedim Biotech and ATMI. Because of this co-operation, the unique levitating mixing technology is now available from two sources, which gives the user a choice and more security of supply. The authors see that here the companies and suppliers still have to work on a paradigm shift and understand that they have to co-operate in the interest of the users, but also in the interest of a much higher and faster penetration rate for disposable technologies for their own benefit. The willingness to give access to their technologies and components, as well as the willingness to share or to cross-licence IP, are just a selection of factors that can accelerate the acceptance of single-use technologies in biopharmaceutical manufacturing. The use of single-use technologies should also increase process efficiency and downtime in production, avoiding cross-contamination. However, although disposable technologies seem to be, prima facie, easy to handle, one will soon realize that these technologies need special and different handling skills compared with conventional technologies and equipment. It may partly be that it is necessary to involve more human resources compared with operating automatic stainless steel process technologies. That might sound contradictory regarding its advantages, but one simply needs to look at the degree of components currently involved in single-use concepts. That is why intelligent concepts are required that reduce the complexity and increase the level of technology integration. Furthermore, one needs to accept that single-use technologies are principally made of various plastic polymers and not of stainless steel. This means that there are clear physical and chemical limits that need to be considered when operating and handling these new technologies. Single-use bioreactors or single-use bioprocess containers often cannot be operated with the same differential pressures as comparable reusable technologies made from stainless steel. Also, the transport and overall logistics for moving single-use technologies throughout a complex production process needs special know-how and skills. This means new and special logistics concepts have to be implemented to guarantee a smooth production process without any interruption. It goes without saying that a proper cost tool will be required to evaluate whether or not single-use technologies are the best option for each unit operation considering that scenarios might change with the volume to be processed. Another big difference to conventional technologies is the validation of single-use technologies. Whereas the overall scope of validation is significantly reduced, other rather specific validation aspects need to be taken into consideration. Leachables studies, for example, are of utmost importance, looking at the number of plastics involved during the entire production process. This means that industry vendors need to have a thorough support package in place that helps users to define the right validation scope. Last but not least, new concepts for waste management have to be applied and implemented and also need special expertise. Although the amount of waste generated by applying single-use concepts in the biopharmaceutical industry is not comparable with the amount of plastic waste in other industries (packaging, food and beverage), the fact that an increasing amount of plastics will not be reused does require new waste management concepts. All of these new aspects and criteria require the in-depth training of operators and workers in the production areas where single use technologies are implemented. One can only recommend establishing an education and training concept before implementing new single-use technologies. A good and practical way is to establish these concepts together with experts from the leading providers of disposable technologies. For example, Sartorius Stedim Biotech offers not only theoretical but also hands-on training at its facilities where actual and realistic production processes equipped with disposable technologies are currently being built up. The biopharmaceutical industry is desperately looking for the next level of technology integration. Fully disposable manufacturing plants for the large-scale commercial production of specific molecules is unlikely to become a reality because of the natural technology limitations. However, the production of material for all clinical development stages, as well as small- to mid-scale commercial production scenarios will increasingly benefit from the intelligent usage of disposables. One can reduce the complexity by focusing on unit operations that are built on technology platforms. The right platform selection combined with the implementation of well-established engineering and automation approaches will emphatically support further technology penetration. The ability of integrating disposables in a hybrid manufacturing design will become more and more important. Aspects such as traceability, assurance of supply and implementation support and training programmes attract increasing notice. Suppliers of single-use equipment will have more and more impact on the manufacturer’s business, thus becoming a strategic partner to the industry. 1.) Bioplan Associates“Current Spending on Disposable Systems” Report and Survey f Biopharmaceutical Capacity and Production. 2.) Merchant, A, and B Pinney. 2006.Perspectives – Disposable Factories, The Boston Consulting Group, Boston.